Myself and five other girls reached Soekarno International Airport slightly after 6:00pm local time. Taking time through the immigration and collecting our luggage and buying local SIM card data package took a good one hour. Met @rin, @lyn and other Indonesian JYJ fans..we chit-chat and get to know each other. It was great and exciting because these are people that I met online and we all just like old friends..talking, laughing, and nervously waiting for KJJ to arrive. A bit later we went to the Exit gate that KJJ will to go through. They put out the welcome banner, one on each side..the above was on the other side that I took. YJ came a bit later in a group and started chanting those words. ‘YJ’ is a gay shipper for Yuhno & Jaejoong (They both in the most famous korean kpop band called Dong Bang Shin Ki (DBSK) before Jaejoong, Yoochun & Junsu left the group in 2009 to form JYJ). 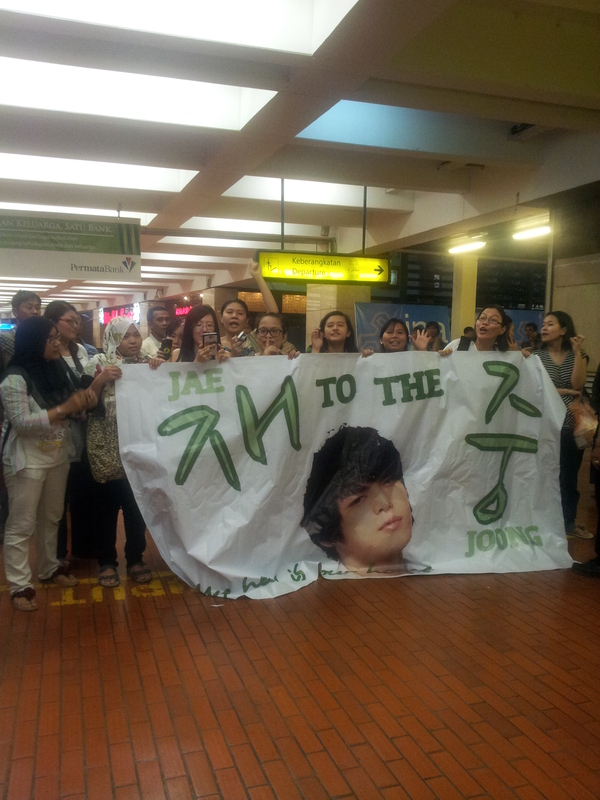 JYJ fans chant much louder “Kim Jaejoong! Kim Jaejoong! Kim Jaejoong!” It was awesome. A fight almost happened because YJ side provocation but it was immediately under control. In Indonesia, there are still quite a lot of YJ followers, which mostly teenagers. 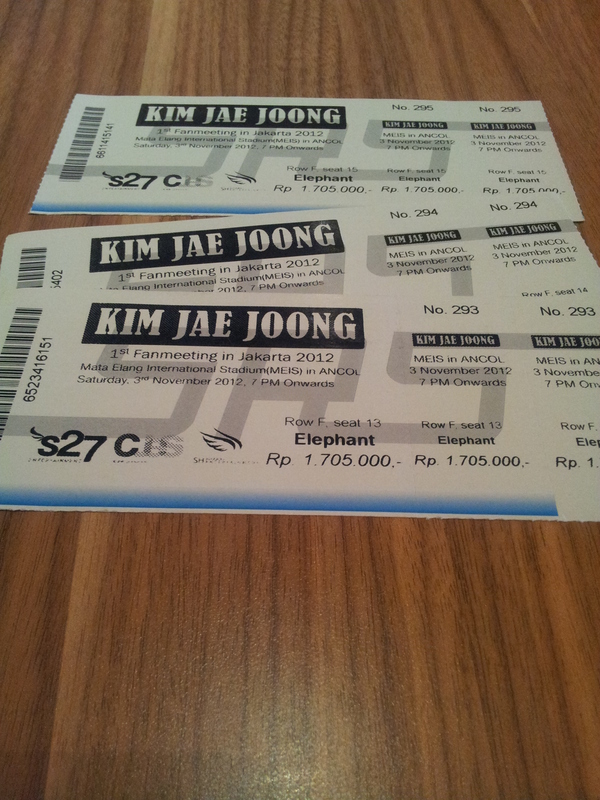 Anyway, finally Jaejoong safely went in his limousine and we off to our hotel. KJJ already looked pale and seriously sick, hope the fan meeting will go on smoothly. Fan Meeting Day – we came early to the venue Mata Elang International Stadium (MEIS) and while waiting for organizer/promoter to do setting up, we hang around at the restaurant nearby. 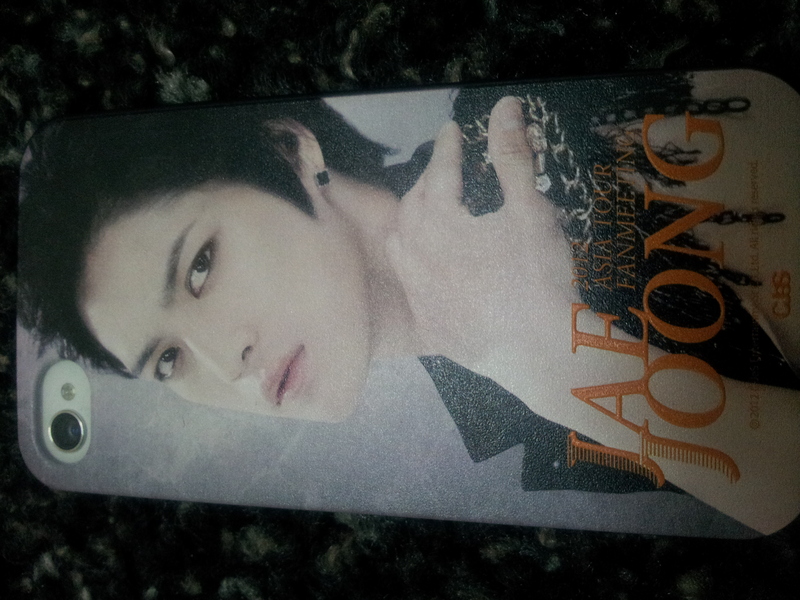 I got my banner towel and Iphone case ^__^..but hot selling item was the light-stick. I was told that a Japanese fan bought all the light-sticks available. Means those behind her are not getting any. Yes, it’s not fair to the rest of fans. Promoter should just tell the maximum amount one fan can buy so others can buy too! We hang around at the venue until time to go in. It was long queue but quite fast. The security checked all the bags and I saw a lot of water bottles on the side table. My friend refused to surrender her water tumbler, she drank all the water in it and she was like taking it one-go I almost thought she could be choking hehe..and the security was trying not to laugh his eyes twitched. We waited about 15-20 mins before the FM starts. He came out with yellow sweater (of course it’s Marc Jacob). Yep, he’s sick. Like seriously ill. No voice. The MC said his fever was almost 40 degree. During event, he smile less that night. I think this FM, he didn’t smile much, except during photography and high5 session. I can understand that with that kind of fever and cold, he has to endure it all and with his high-spirit to see us, his fans, I really respect him. What a strong person. He stand tall and try his best to entertain us for 3 hours. 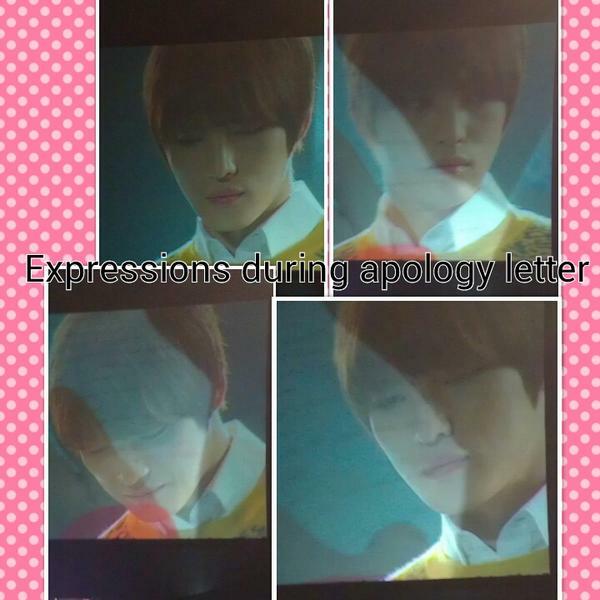 His expression during his apology letter says it all. The MC voice and his face on the screen, it’s really heartbreaking for all of us there. Photogrid thanks to dearie @chewyalmond^^..to see him making extra effort to smile despite his fever, it hard for me to watch him because he should be lying in bed, resting, listen to light music and sleep 24hours straight to gain his strength and recover faster. After the apology letter, he sat on the red sofa and a very straight forward program commences. He speaks (well, Ipad texting) not as much..it was more of showing ‘behind the scene’ Codename: Jackal, 5 top selection scenes in ‘Dr Jin’ and ‘Protect The Boss’. Normally he sang to his fans in all his fan meeting, but this time, due to his voice-loss, we sang for him, ‘Living Like A Dream’. As much as we really want to hear his voice, I think all of us feel kind of intimate with him because we sang for him..all in one voice, synchronized and some were even crying while singing for him. Questions and answers were funny at some parts. He wrote the answers fast..and deleted it faster too haha..I like the part when MC asked if he ever fall in love with the actress that he work with, of which he answered he did have a crush to one of the female staffs! That’s cute! I seated about 4 rows from him during the photography session and when he walked by to his chair, those few seconds just enough to be mesmerized by his handsomeness hehe..It’s true what people are saying about him. He has a face of a vampire with his porcelain skin ~ He is quite tall (5’10’). And skinny. He is calm and polite. He is ONE IN A MILLION! Finally the FM ends. Doesn’t feel like 3 hours. Yes, for me to finally see him after idolizing him since 2008, I’m so greedy to see him longer, hear his voice, hear his laughter, hear his cheekiness, watch is boyish naughtiness, watch him bonding with his fans and those lucky ones that can play games with him, take picture with him, and a lot more!! But not today, because today he’s sick and no voice. Another best thing during this trip, that I met new friends and I have a wonderful time with everyone.